Emerging talent ~ Lugger? ~ and the same to you ! Err no, lugger is a type of sea going vessel or rather the sailing rig on one. ‘Barnabus’ the lugger has to be one of the most curious entries in the section, Merchant sail, for several reasons. 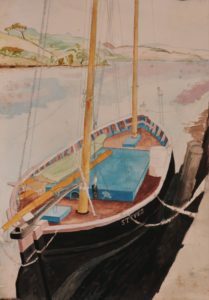 Barnebus, lugger, approx 23 X 35 cm (9″ x 14″) Watercolour, made approximately 1974. Available, £150 ex studio, ex frame. I was sitting in sunshine on a bollard on a quay near Penryn, West Cornwall. Barnabus is a charming very early ‘Gordon Frickers’ study, one of the earliest surviving examples of my work and emerging talent. Look carefully and you can see how , unaware I could be classified as ‘colour blind’, I was struggling to understand the colours. Red sails in the sunset? Barnebus, I don’t know where she is now, is also a very rare example of a type of vessel that used to number in the thousands, the Cornish lugger. I thought she would make a good ‘drawing exercise’ so settled down to produce this carefully drawn study of Barnabus then decided to try and colour the picture. No reasonable offer refused for this picture. Luggers were to feature more in my life, in two paintings quite famously.